Welcome to night numba Four of my mega horror movie list countdown to Halloween! I am listing some of my favorite horror movies to watch in the month of October! The stars of Texas Chainsaw Massacre are back and now involved in some strangeo radioactive Scfi-Horror drama! Future-Kill follows a group of fraternity brothers who mess around with the wrong crowd, Splatter’s Crowd. Splatter is the menacing leader of the scarred radioactive punks and the one “Mutant” so disfigured that he needs to dawn a full body metal costume to not horribly terrify you — also paired with an impressive haircut! 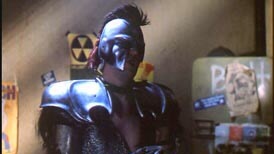 A large part of the film centers on Splatter framing the frats for murdering the peaceful Mutant leader – which results in the entire mutant movement hunting them through dilapidated buildings and empty streets. 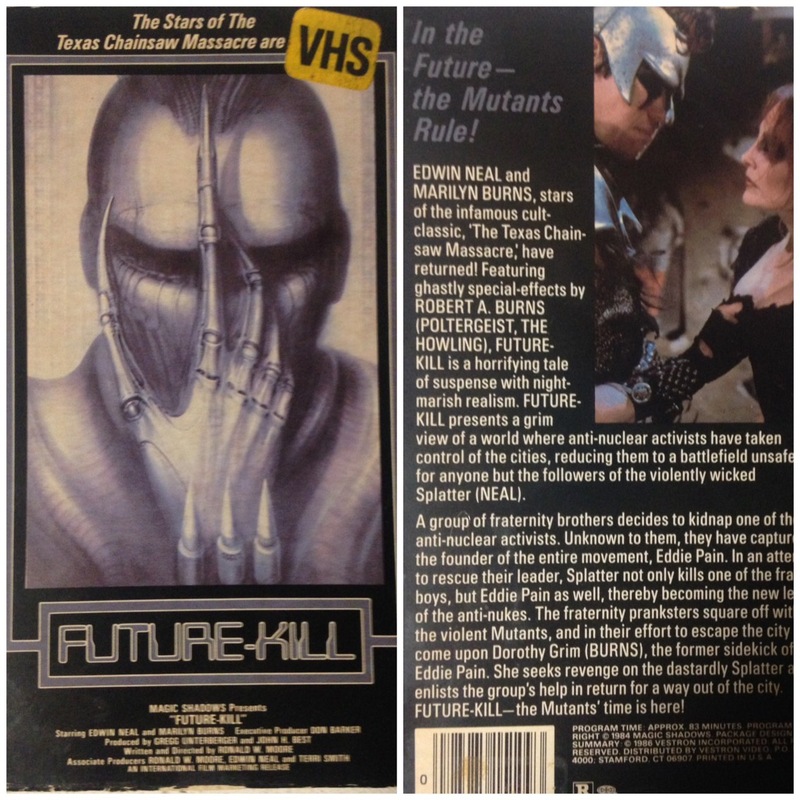 Future-Kill is mostly trash garbage – especially those weird scenes with the obese woman – but is a fun entertaining slasher romp that will not disappoint you at any slumber party. As for “The Stars of the Texas Chainsaw Massacre” they’re barely in the film. Clearly the tagline was used to garner some attention as their on screen prescience is mostly absent – especially from Marilyn Burns we only really get to see her at the end and she is mostly unrecognizable. In fact, Edwin Neal who plays Splatter is also not noticeable as the loveable Hitchhiker from The Texas Chainsaw Massacre. But, it is fun to see them on the screen together and in far out roles. If you are in need of a Halloween costume this season – please be Splatter! I don’t think this Halloween costume has ever been attempted so I am officially on a hunt to see someone dressed as the forgotten horror madman SPLATTER!